An interesting looking history of the difficult relationship between the Catholic Church and China, The Catholic Church in China: 1978 to the Present (Palgrave Macmillan 2012) by Cindy Yik-yi Chu (Hong Kong Baptist University). The publisher’s description follows. 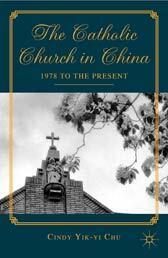 This book traces the history of the Catholic Church in China since the country opened up to the world in December 1978. It comprehensively studies the Chinese Catholic Church on various levels, including an analysis of Sino-Vatican relations, the control over the Catholic Church by the Beijing government, the supervision of local Church activities, and the consecration of government-approved bishops, the formation of priests, and the everyday lives of Chinese Catholics.